Daily: 10:00 a.m. to 6 p.m.
Cabanas, chaise lounge, bar seating, day beds. 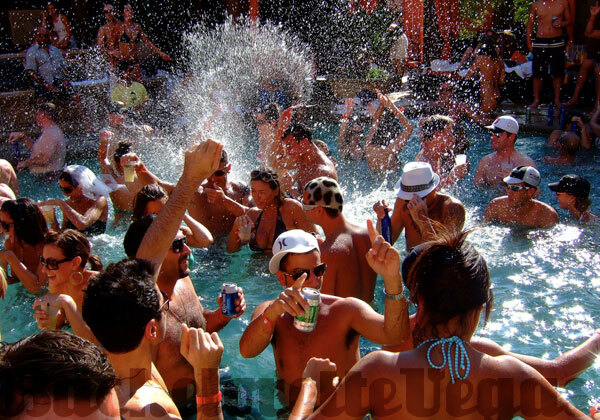 Tucked in the corner of the Venetian, TAO Beach is the quintessential Las Vegas pool party destination for bachelorette parties or just a day of non-stop excitement. Enter the venue in your bikini, sunglasses, and heels, and get ready to enjoy the lush, secluded oasis that is TAO Beach. 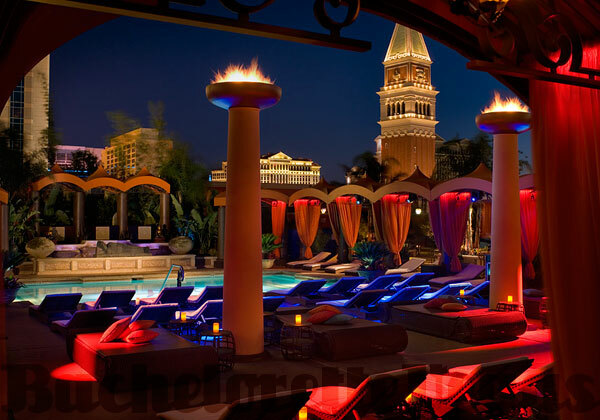 This Las Vegas hot spot can be found atop the famous TAO Nightclub and Asian Bistro. It is currently open for special events, as well as weekly Sunday Sunset Sessions which feature top-notch local, national, and international DJs. Don't miss Saturday nights at TAO Beach. This is when the beach club transforms into an outrageous pool light show, complete with Chinese lanterns that float on the water and several 14-foot tall columns that hold fire that light up the night sky. TAO Beach Las Vegas has a sophisticated Asian-theme and European-style, making it one of the top pool spots on The Strip. While you'll technically still be in the desert, the feel of the beach club will make you feel like you're on a tropical island with 40-foot bamboo trees and hip-hop and dance music. TAO Beach pays great attention to detail, decor and service. Since opening in 2005, the beach club has hosted plenty of celebrities, from Jessica Simpson and Jay Z to Michael Jordan and Heidi Klum. If your bachelorette party would like a place to sit back and relax, TAO pool party offers twelve lavish cabanas for rent. These offer guests the largest cabanas in town, as well as a private HD plasma screen television, DVD player, X Box 360, full DVD and game library, private safe and storage, internet access, stocked mini fridge custom to order, chilled luxury towels, free stylish sandals, and rentals of pre-programmed i-Pods. While enjoying all that this Beach club has to offer, get pampered by a professional staff of private masseuses or soothing spa treatments. Even in the cabanas, you won't miss any of the wild pool scenes due to the setup. If your bachelorette party is large, consider renting several cabanas, pulling back the curtains between the huts, and throwing one huge bash with all of your girlfriends. The party doesn't stop when the sun goes down. Enjoy TAO Beach beneath the stars as the beach club provides the upbeat music for dancing and bottle service for luxury. 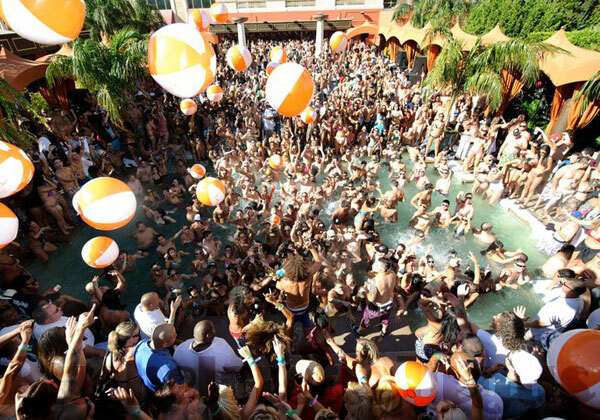 As you enjoy the poolside experience of TAO Beach party, don't forget to grab some frozen drinks, beer, shots, or champagne. When all the drinking and dancing has made you hungry, grab an appetizer, sushi, or selection from the grill menu at TAO Asian Bistro. Available from 11 AM to 6 PM each day, the Asian Bistro offers many refreshing choices, including spring veggie rolls, ginger and lemon-sprinkled edamame, and strawberry mojito. TAO Beach is the perfect place to throw a bachelorette party or enjoy a day/night out with your best friends for any occasion. Wear your beach attire and rock out to a combination of hip-hop, rock and house music. The cover price is $20 for men and women on Friday and Sunday. 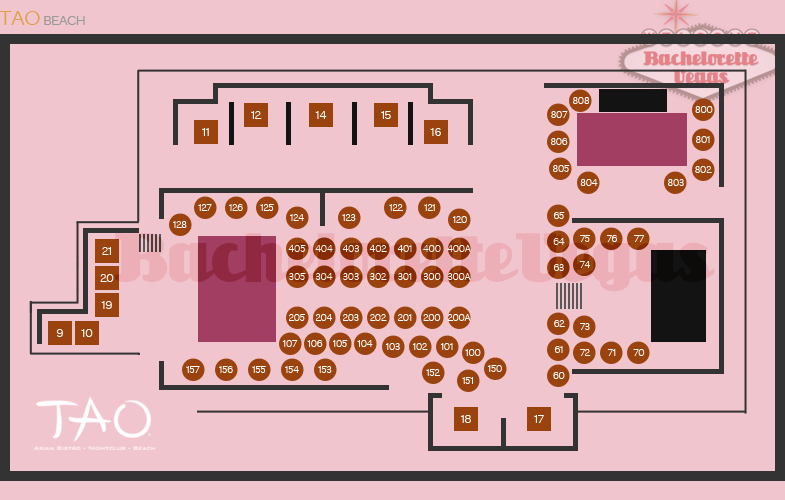 On Saturdays, the cover price is $30 for men and only $20 for women. The rest of three week, there is no cover with the exception of holidays and special events. If you're considering TAO Beach in Las Vegas for your bachelorette party plans, rest assure you have found the best all-around party haven.